In fact, once learned from the house restaurant baker, I can hardly recall hosting a large buffet party when a tray of these were not spread across the dessert table, right next to the other select similar tartlets, those spooned with creme anglaise then topped with a different colored fresh fruit, tart red raspberries, perhaps strawberries or tiny slices of bright green kiwi. Gently brushed over with warm apricot preserves, each fruit presented a shiny glisten after assembling the topped delicate display. I’m not even sure how they disappeared off of my ‘go to’ list but it might have something to do with having an athlete daughter where every weekend and holiday over the course of years became consumed with game travel, and later on, tailgating. No, these are not what I would recommend for this genre. It could be done, anything could be done for the sporting tailgate table, I just wouldn’t recommend it. Still, at the same time after gathering a recent Pick Your Own surplus at the Shady Brook Farm in Yardley, PA, preparing lemon curd tarts topped with the fresh blueberries was a very pleasurable first thought popping into my mind. Perhaps this also has something to do with my daughter, Alex the athlete, having graduated from college in May so for the first time in the course of many years I won’t be required to game travel twice a weekend, on holidays, or, preparing gargantuan amounts of food for the post match tailgate table. That being said, I am indeed thinking of the team just now as they run the gauntlet and officially begin pre-season at midnight tonight and am cheering those ever special in my heart for a great season ahead. Go Team. The process of carefully unwrapping the old tin Tartlet Molds between soft tissue paper felt as if I was unraveling small trinkets of an antique, something uniquely reminiscent, special, viewing each piece slowly and carefully before building the stack on top of the other. The purple felt outer bag with the golden silk ribboned pull string re-purposed from an old bottle of Crown Royal had contained the treasures together well throughout their extended years of sojourn. The tart dough took all of about three minutes to prepare. It made me wonder why I had waited so many years. But a quick glance of the powdery flour jar, the sifter, the food processor, the knives, the plate of butter cut into little bits, one measuring cup filled with ice and cold water, a smaller measuring cup for measuring and drizzling in, well, then envisioning the lemon curd prep, equipment, and dishes, it rather made me appreciate the pleasure, but also to understand how little time I have had for such pursuits over the years. But then, as it is written, there is a time for every purpose under heaven, and this moment is a time for renewing use of some special treasures like the old tin tartlet molds, perfect for preparing Fresh Picked Blueberries and Lemon Tarts. Tart dough yield depends on the size and shape of tartlet mold using but one batch of dough generally makes between 22-25 tarts. 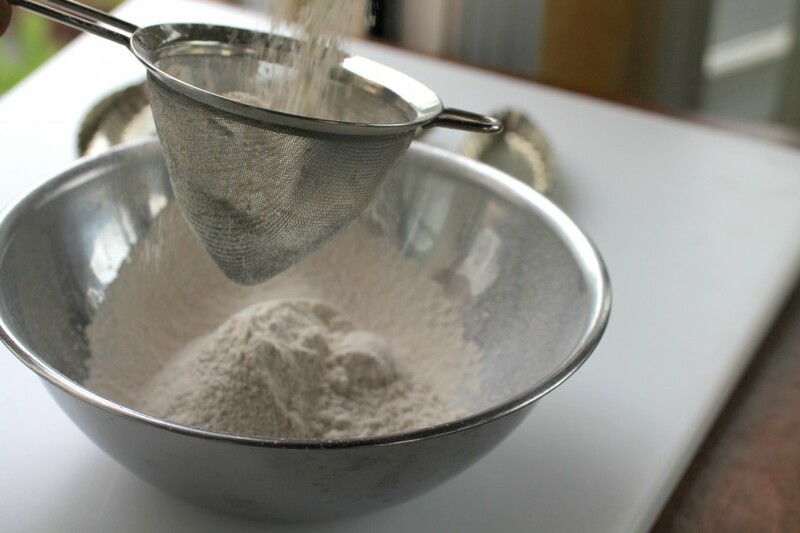 Pour the sifted flour and salt into a food processor. Scrape in the bits of butter. Pulse the mixture about ten to twelve times or a bit more until the dough looks coarse. With the motor on, drizzle in the ice water a bit at a time just until the dough comes together and forms a ball, then remove from the processor. If the dough is slightly wet pat just a bit more flour onto it. 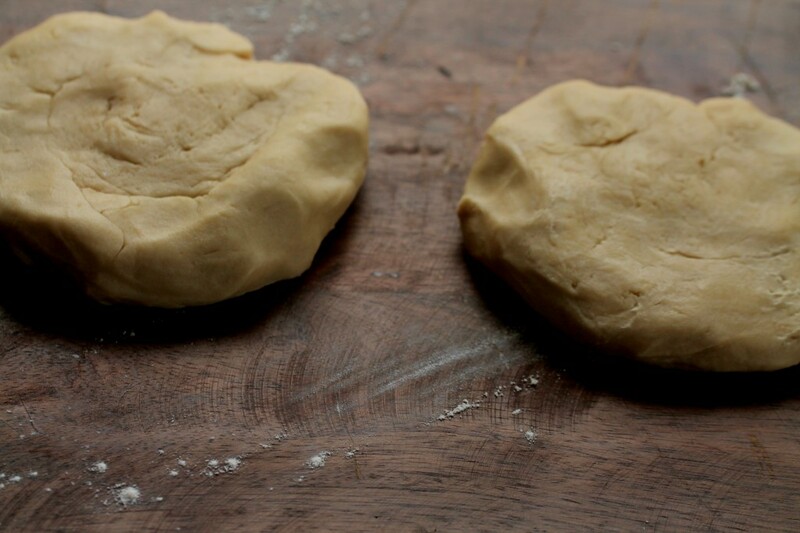 Press down on the dough to flatten, cut it in half, then form two round discs. Cover the discs with plastic wrap and let rest in the refrigerator for about twenty minutes. If using the dough later, remove the dough from the refrigerator about fifteen minutes before rolling to soften closer to room temperature. Grease half of the tart molds, saving the other half to place on top of the dough in the bottom tart mold. Preheat oven, convection preferred to 350 degrees. One at a time, roll out the discs on a lightly floured surface. Place a tart mold lightly onto the dough and make a cut a little larger than the shape to fit inside comfortably, then continue with each of the greased tart molds until all are filled, placing a second ungreased tart mold on top of each fitted tart then setting onto a baking sheet. Place the tray of tarts into the oven, bake for 7-8 minutes before removing the baking sheet and removing the top tart mold weighting the dough. Bake another few minutes, approximately, until the tarts are golden colored and cooked, remove from oven and cool. Shortly before assembling tarts warm the apricot jam. 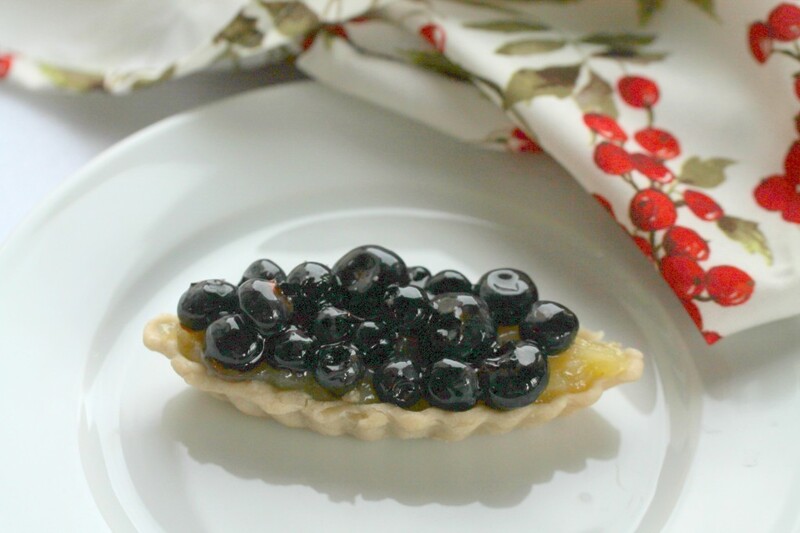 Place blueberries on a plate and brush all over with a pastry brush before placing each blueberry onto a tart. Alternatively, blueberries may be arranged on each tart then carefully brushed over using a pastry brush dipped into the jam. 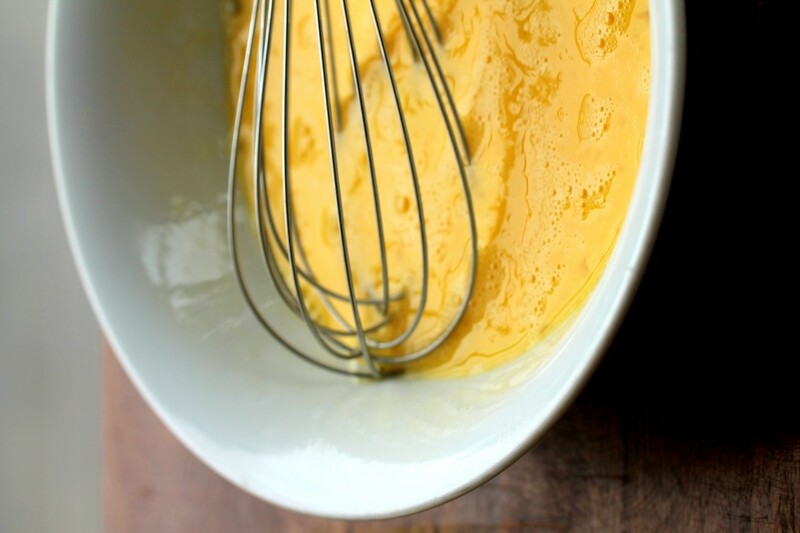 On very, very, low heat, whisk both the yolks and the eggs in a medium sized stainless steel pan. Whisk in the lemon juice, zest and sugar. Drop in the butter a bit at a time whisking vigorously at each addition. 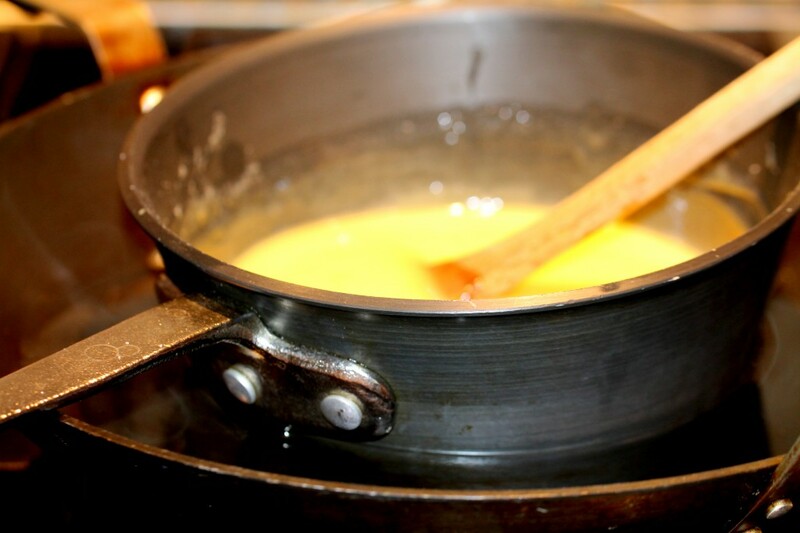 Continue stirring or whisking until curd has become thickened like a custard, approximately between 7-9 minutes. Turn off heat. 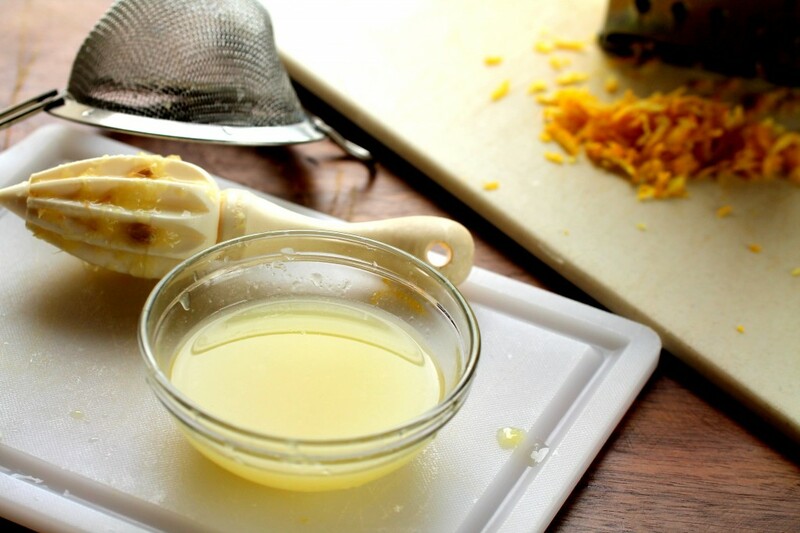 Transfer lemon curd to a glass bowl and refrigerate for at least a few hours covered with plastic wrap. Spoon, or using a pastry bag, pipe, lemon curd filling each baked tart. Top with fresh glossed blueberries. This entry was posted in Sweet Treats and tagged Fresh Picked Blueberries, Fresh Picked Blueberries Lemon Tart, Lemon Tarts, Pick Your Own, Shady Brook Farm, Tart Molds. Bookmark the permalink. Post a comment or leave a trackback: Trackback URL. 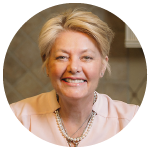 Dear Peggy, what a delightfully written post – I loved, loved everything about it! 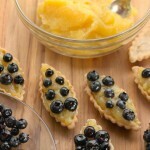 Oh, these tiny tarts are right up my alley, I do not own these lovely little tart molds but I have been wanting to get some for the longest time – no reason not to get a few very soon and make these delicate tarts with that wonderful lemon curd and those lovely blueberries and mybe some raspberries! To have just one now with my cup of Earl Grey – even at 10:30 p.m. that sounds wonderful! Hi Andrea, Thank you, I do believe these tarts would go lovely with a cup of tea. My tart molds must be over thirty years old- so a worthwhile investment from a cooking shop in Philadelphia, they still look and serve perfectly. I have used the boat shape for both sweet and savory fillings and also have the small round indented style, of course you need two for each tart so once unpacking them- I had enough, but not as many as thought. These are wonderful with raspberries too, and of course, either go well with creme anglaise too. Thanks much for joining in! You have me drooling over here. I am a blueberry fanatic and love anything with blueberries. Phil recently posted…From the Madness of NYC comes 300 Blog Posts. Hello Phil! Great to see you. 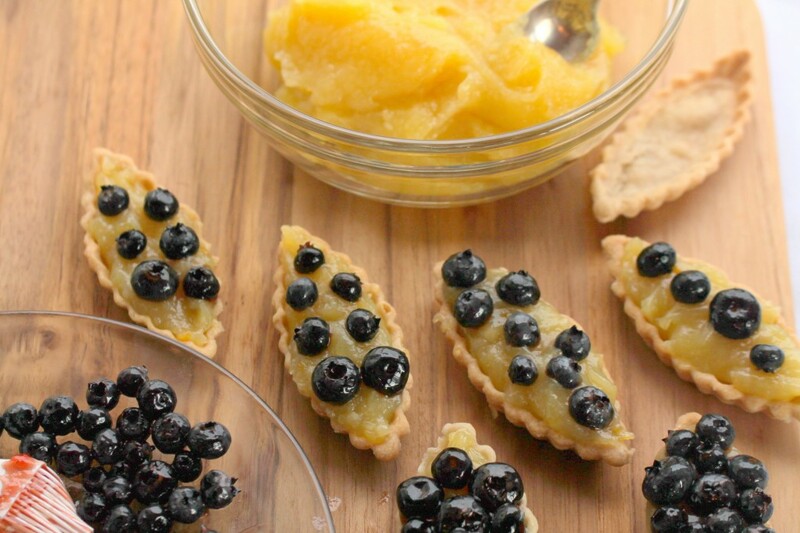 Yes, I love blueberries too and these tarts are really tasty! Congrats on reaching your 300 Blog Posts and very best wishes! Thanks for joining in! Hi Peggy, these little tarts are perfection, love the shape and the way they look. Gorgeous pics! Hi Cheri, thanks so much! They taste quite good too and went faster than I could keep up with among folks! I’ve a friend in Europe who’s lemon curd, though obtained a great flavor, did not reach the thickness. Though I’ve not had this occur, variations can happen in altitudes or with different burners, so I’ve recommended trying to let the lemon curd sit to set following whisking and stirring for ten minutes, or, to remove the top pan from the double burner and heat it gently for a minute or so on very, very low heat, then let set. Thanks for joining in!